The Philippines, through the Department of Trade and Industry (DTI), continues to advance the promotion and development of micro, small, and medium enterprises (MSMEs) in the ASEAN region through the “ASEAN MSME Development Summit” on 14 July. Under the Summit’s theme “7Ms Towards Shared Prosperity in ASEAN,” the Philippines laid out a seven-point strategy essential for MSME development—mindset, mastery, mentoring, markets, money, machines, and models—which the country wants the region to adopt to advance the ASEAN economic agenda of shared prosperity. The Summit gathered representatives from the private sector, civil society, and ASEAN governments to develop new ideas and identify areas of improvement to successfully place MSMEs in the vanguard of the ASEAN Economic Community’s (AEC) drive to achieve inclusive growth. “The Philippines has been in the forefront of providing substantive initiatives toward establishing MSMEs at the core of the ASEAN economic agenda. We want to elevate discussions and provide the right information on how we can further assist them to support our goal of achieving inclusive growth in ASEAN,” said ASEAN Economic Ministers chairman and DTI Secretary Ramon Lopez. In pushing the MSME agenda, the Philippines seeks to address key challenges in their development and achieving prosperity in the region. Experts in various fields discussed the seven-point strategy taking into account the challenges that small enterprises face. Session 1 with Mindset as a theme, provided discussions on how to train and orient entrepreneurs with the right entrepreneurial characteristics and attitude. Sessions 2 and 3 on Mastery and Mentoring, tackled the core principles of entrepreneurship that will equip MSMEs with the necessary competence and effective knowhow to seize gains for their ventures. Session 4 covered Markets, a key component in the survival of any business. It discussed how markets are made more accessible and the various technologies that can help MSMEs gain traction in the local and international arenas. Session 5 on Money took a closer look on financing schemes that MSMEs can further explore and access and some key initiatives governments undertake to facilitate access to much needed capital. Lastly, Session 6 and 7 gave an insight on how access to appropriate Machines and technology, and choosing the right business Models can help upgrade their businesses, boost productivity, and improve marketability of products and services. 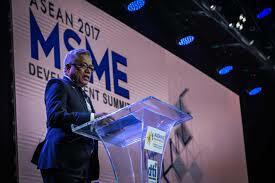 “MSMEs comprise the backbone of our economy and thus vital to the country’s growth. With the help of 7Ms, we know MSMEs are a step closer to advancement,” said DTI Undersecretary for Regional Operations Zenaida Maglaya. ASEAN government representatives and MSMEs graced the event and expressed full support to the Philippines’ call for greater cooperation in placing the interest of MSMEs at the core of the AEC agenda. The CBIP’s mandate is to organize business and investment promotion activities that will engage the international business community, government, and other concerned parties in the drive to achieve the AEC’s goal of shared prosperity in the ASEAN region. During the Summit, the Philippines’ DTI also launched “SIKAP: Sipag at Abilidad ng Pilipino,” a coffee table book that showcases success stories of MSMES across the Philippines. It also mounted a Go Lokal! Trade Exhibit, which showcased world-class products of Philippine MSMEs.